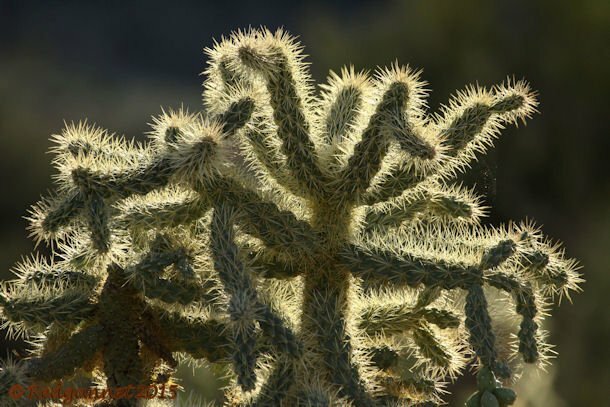 The internet appears to have nearly as many people getting caught up with Cholla Cacti as it has cute kittens doing funny stuff. It almost qualifies as a genre in itself. 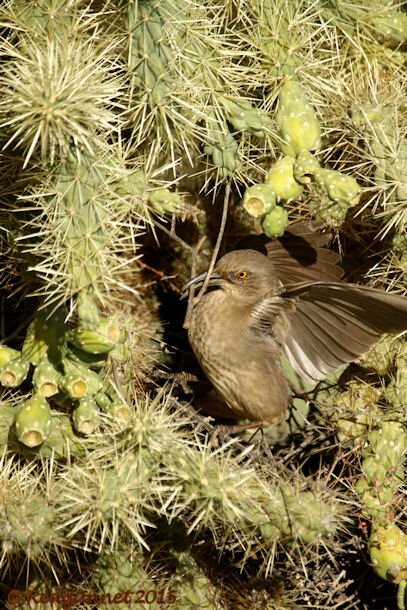 Now this is only a personal suspicion, but I reckon that the birds of the Sonoran Desert have set up candid cameras and are getting their Youtube footage by enticing birders close enough to the cholla bushes for the spiked fruit to make the leap onto their innocent carriers. It is possible that the birds feel so secure in the protection of the vicious, malicious plant that they can afford to reduce their flight distance and allow a close approach. 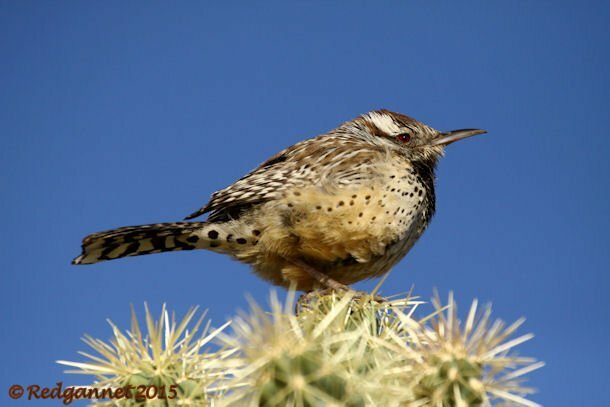 The Cactus Wren is especially at home in the Sonoran Desert and can often be seen silhouetted at the top of a cholla. The fruits easily detach and dig their murderous, barbed spikes into delicate Western Palearctic flesh and the birds tempt unwitting watchers closer and closer until……. Please note that this one is endorsed by the Profane Society of America. It is not just the wrens that get their kicks by enticing folk onto the spikes like wreckers luring ships onto the rocks. 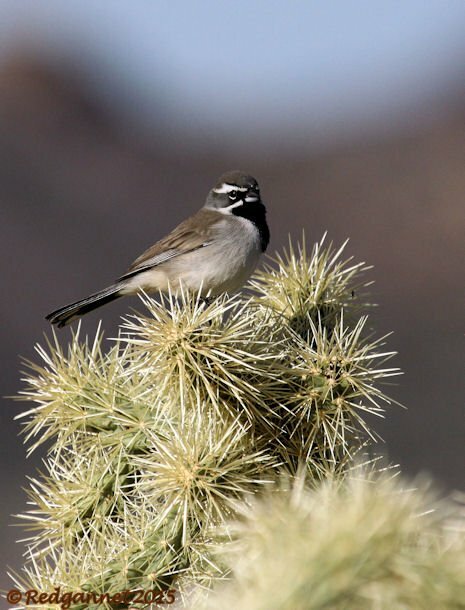 Black-throated Sparrows will tee themselves up atop a cactus to draw the unwary close enough to get skewered. 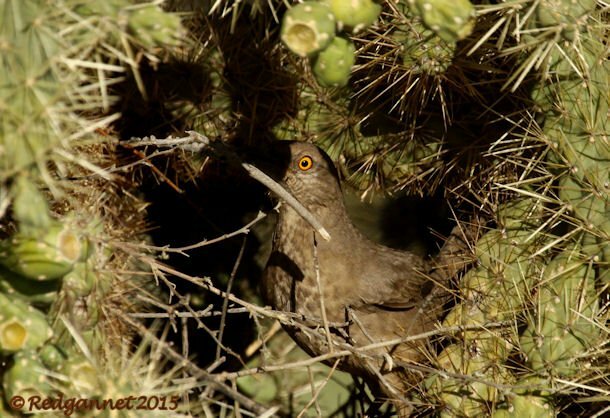 On this occasion the biggest draw was the Curve-billed Thrasher that was nestbuilding in a cactus beside the path at the Lost Dutchman State Park, just outside Phoenix. How on Earth did it manage to manoeuvre twigs and sticks in such a confined space, surrounded by so many spikes without getting punctured or losing an eye? The birds aren’t immune, alas. A mummified cactus wren hung from a cholla in our neighborhood for months after impaling itself.